When you apply Layla Human Hair Toppers and Toupee to your head, they will help you create a perfect installation and a very natural look, especially for customers who have traction alopecia or thinning edges. As one of the most well-known Wholesale Hair vendor, Layla Hair is excited to work with both retail and wholesale clients to offer you amazing Wigs, Hair Toppers and Toupee. Nowadays, hair topper extensions, human hair toupee and crown topper wig are widely used by who want to lengthen existing hair and change the external appearance, also by who are suffering from hair loss and by the victim or patient wishing to conceal scarring. It is not hard to list out a ton of celebrities who wear hair toppers. Some celebs who wear hair toppers would have their own hair stylists (or hair artists) designed their one-of-a-kind luxurious human hair toppers. However, do not be surprised knowing that there are a lot of actresses who wear hair toppers choose to buy these products at a popular hair topper manufacturer too. Layla Hair wholesale hair supplier is so proud of being one of the largest wholesale human hair distributors in Vietnam specializing in human hair topper piece, hair topper for short hair, hair topper for thinning crown and human hair monofilament topper. Come to Layla Hair virgin human hair company, you won’t have to worry about the quality and life expectancy of Layla Hair human hair wiglet topper because we guarantee that all our human hair topper pieces and human hair toupee are made of 100% Human hair collected from Vietnamese and Cambodian healthy donors. That’s why you cannot find any synthetic hair in Layla Hair Wholesale human hair toppers and toupee. We have the best hair toppers for sale. We found that these questions about Human Hair Toppers and Toupee are asked most frequently, so let Layla Hair answer all of these questions for you. Actually, it is already presented by the name of the product. Regardless of wearers needs covering thinning scalp and adding more volume to their natural hairs, one can easily find out what is a hair topper just by looking at hair toppers before and after photos. Rather than the Full lace wigs which covers the whole human head and neck, these crown topper hair pieces and human hair wiglets for thinning hair are designed to cover hair loss, baldness and hair thinning area JUST at your crown. These beauty stars also add more volume to your own hair. In general, the material is utilized to produce hair toppers or toupee is either synthetic hair or natural hair. However, because of causing the potential for permanent hair damage and hair loss, synthetic hair toppers (toupee hair) is no longer gain the preference of the topper shop as well as topper wearers. In fact, artificial hair is not as soft as human hair, so it can make you itch or even damage your scalp. Whereas, hair toupee and hair topper for thinning hair from Layla Hair Vendor is human hair (best human hair toppers) – which is very velvety and just like your natural hair. Layla Hair wholesale virgin hair supplier guarantees that all Vietnamese and Cambodian hair from Layla Hair Vendors is 100% Remy Vietnamese and Cambodian hair. It means that all cuticles are the same directions from roots to the top. As a consequence, Layla Hair crown toppers wig and toupee hair are absolutely natural, velvety, silky and hard to tangle. Besides, they can be washed, cut, straightened, curled and dyed as you wish. Because one of the purposes of wearing 3 piece hair toppers or lace front hair toppers (toupee hair) is to cover partial baldness and conceal the hairlessness, your human hair toppers including human hair topper with bangs, lace front toppers and mono hair toppers should have the same color as your natural hair. Layla Hair wholesale hair weave distributor always makes every effort to match the topper’s color to the natural hair color of customers. Layla Hair virgin hair wholesale hair vendor can create best women’s hair topper and toupee hair such as hair topper with bangs with various colors such as grey, brown, blond, ombre colors, 3 line or 4 line colors, even piano colors if you wish. Moreover, in Layla Hair Remy hair wholesale company, the lace that is used to sew each strand of hair to is also invisible and as much flesh-colored as possible. Workers in Layla Hair Vendors also can create human hair toppers for thinning hair and Vietnamese hair toupee with bleached single knots giving it amazing realism in any light. Due to being undetectable, Layla Hair extension toppers and toupee hair for men (short hair toppers) is a favorite item of topper hair salon and famous celebrities. Hollywood and television stars of both past and present show a propensity for wearing hidden crown hair topper and clip in hair topper extensions for professional reasons, particularly as they begin to age and have to maintain the attractive human appearance their fans have been familiar with. However, the answer to this question “who wear hair toppers?” are not only limited within the celebrities. Research has shown that people with good-looking hair are more appeal to the others, and that those who have better appearance tend to perform well at jobs. For these reasons, human hair toppers are applicable to anyone who wants better appearance and confidence in life. In term of making hair toppers and toupee hair, there are 3 kinds of lace namely full lace, full PU skin lace and mixed lace for you to choose from Layla Hair virgin hair company. These bases are specially designed for each type of baldness and thinning hair. So you always have the best choice, most comfortable and secure of hair topper for your own. For example, with those who have severe baldness sensitive skin, it is advisable to choose an airy material as base. As long as you can choose an adhesive that work well for your skin type and water-resistance, then you can totally go out swimming without being afraid it will be ripped off. As hair toppers just cover your crown, they will be as comfortable as having accessories on your head. They are comfortable, light weight (they just weight as much as a closure/frontal do), and the effectiveness is crazy. Though we are still far from making silk base hair topper (of course silk base human hair topper), as many customers want to try it, we will try to do it in the very soon future. Listening to customers’ requirements, Layla Hair wholesale hair extensions manufacturer offers the best hair topper for thinning hair and men’s toupee with 130% density or more giving you a bushy hair in a minute. If you want to change your hairstyle, let begin with middle part, triple part and free part human hair toppers (toupee hair) in the first place, then taking the length of hair into consideration. Go to Layla Hair raw Cambodian and Vietnamese hair wholesale vendor to freely choose any straight hair, wavy hair toppers and best curly hair toppers, hair topper with natural part or wig topper with bangs with the hair’s length varying from 16 to 32 inch. As the personal preference of customers and topper salon is varied, Layla Hair Vendors offers human hair piece toppers with clip-in (or clip on hair topper), tape-in and glue in toupee hair. You can also use liquid adhesive as you wish. Layla Hair wholesale weave distributor highly recommends you to purchase clip in human hair toppers and toupee mainly because hair topper wearers can apply and remove it easily and effortlessly. So if you are going out for a dinner with your friends or dating with a new boyfriend, let dress up and choose an outstanding hair topper and toupee such as a curly hair topper from Layla Hair Vendors to attract people’s attention right now. Layla Hair Wholesale Hair Vendors are pretty sure that our service won’t make you disappointed. As Layla Hair Company only use 100% human hair to make all of our products, you can style your hair topper anyway you want: dye and cut at home, or bring them to your favorite hair stylist and let them do the work. Wigs and Human Hair Toppers have many advantages over real hair because it can create countless hairstyles while helping you overcome your shortcomings. So the wigs or wig toppers are no longer the cover of the bald head as it once was, it has become a beautiful fashion that is very popular with children, sisters, ladies and gentlemen. Nowadays, there are many models of wigs from short hair, long hair to straight hair, curly hair, blonde hair, … So you can freely choose for I to fit the personality as well as circumstances. The Hair toppers and Toupee with bangs is a lot of color, is polished silky, depending on the preferences of customers that choose which hair is suitable for the age and Hair style. These hairstyles are mainly for thinning hair, creating a feeling of a thick, healthy hair and can be shared by everyone. A lot of you would be likely to try your first hair topper on Amazon. The fact is the hair toppers amazon have are not only amazon human hair toppers, they could be synthetic hair toppers as well. Try to search some credible human hair topper reviews and choose those who are among the first, the largest manufacturer to place your belief on. These manufacturers have the most likeliness to be the one who makes the best hair toppers. It really depends on the base material and the hair quality that you choose. PU skin tends to last longer because hairs are directly integrated in it, and of course human hair toppers will last longer. These crown topper hair pieces are expected to last at least 1 year. They could be wear for longer unless you are looking for something different to change your hairstyles. You are expected to find out the answers for these questions through a direct conversation with the sellers. The baldness/thinning condition is different for each person, so the definition of “best” might vary a lot. Often a hair topper for men will cost around $100-$150 while hair toppers for women might vary from $150-$300. Sometimes the best ones are not the most expensive ones, and only the most suitable ones are what you need for. However, regularly you get what you paid. It is not recommended to make hair toppers at home because this requires a lot of skills. However, if you are keen on making the one-of-a-kind product by yourself and just for yourself. Then all you need is good hairs and a template for your baldness area. Good hairs definitely last longer, so our recommendation is to buy 100% human remy fine hair. That would be better for starting off. If you are not familiar with the ventilating process, then you can totally head for something similar to hair toppers. And pull through which are easy to make and look natural at the same time. Here in Layla Hair Company, we sell both bulk hair and weft hair extensions to serve both of your needs. Can women use human hair wig toppers? Many people think that wig topper is more popular with men than women. However, human hair topper for women is really more and more enjoyed because of the usefulness of it. What is the difference between the wig toppers and top piece? Unlike full wigs, hair pieces and extensions do not cover the overall head. They are clipped in to your bio hair to add volume, fullness, or cover baldness in specific areas. 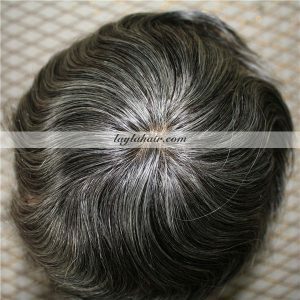 Likewise, wig topper is used for cover entire the top of head area including baldness area and a part of bio hair. For example, if you are hair loss in case that doesn’t have hair, wig topper looks like a pixie hairstyle. This is an example to help you visualize easily. And, top piece also cover the top of head area. But the main function is to add volume or cover baldness in specific areas. Are synthetic or human hair toppers better? You can think that once human hair is separated from the natural hair development of human. It doesn’t work well any more and is easy to be damaged . That is not right completely. Human hair after we collect to make hair toppers will be kept in good condition and cared following a special process in order to maintain the original quality of natural hair. When the product is given to our customer, we always remind us about hair care. Care hair toppers is the same way how to care your natural hair. If you care natural hair toppersthoroughly and properly, you can last its lifespan up to 2 years or longer. About synthetic hair topper, I can understand the reason why you like it more. This is because you feel it is cheaper, more durable and care more easily. Almost people buy it because it is cheap. Is it really more durable, but does it have better quality? This is not sure. I sure that the synthetic hair topper is not as natural as the real human hair topper because of the difference about the quality of them. – Burn test: Synthetic hair which is burned has smells like rubber, melts slowly into a ball and produces black smoke. Human hair will immediately catch fire, burns nearly promptly curling into a little ball and has specific smell. – Bleaching: Human hair lightens quickly depending on the grade. May burn if it is synthetic hair . – Texture: Human hair tends to be softer and shinier than synthetic hair. Natural hair has each of its strands coated with scales so: smooth if you rub it downward, but resists and feels if you rub it upward. Synthetic hair is smooth you rub it by any way. – Colour: If the hair has subtle changes of color and highlights. It is most likely natural because it exposure to natural light. Human hair comes in the natural color(black or brown). – Price: synthetic is cheaper than human hair toppers. – Wave: Real human hair topper turns to its natural state when wet. Synthetic is not. – Tangle: synthetic hair is easy to be tangled and coarser than human hair. – Shedding: should only be a few strands when you brush through. But if it is excessive, it is not real human hair. Sealing the wefts of the weave will ensure the hair stays on. You should a wide tooth comb from the tips to the roots to reduce shedding. Where to buy hair topper? Instead of that you must go to hairdress shop or hair salon, nowadays, you can purchase hair topper through internet easily. You can find out hair toppers in many familiar shops online or hair selling websites such as Amazon, Ebay, etc. After finishing order, they deliver your order to your door. However, it is extremely important to choose a proper hair topper for yourself. Of course, you can do it yourself – find out a hair topper which has suitable length, color blending with your natural hair color, good quality,…. I really recommend you should purchase hair toppers in a reliable website such as laylahair.com. Why? Because we help you answer any question about hair problem. You are facing and show you how to buy the best product. If you want to buy a hair topper, you can contact us by whatsapp( +84 989 633 424). Or you can chat online with us at our website. Because we are always here and ready to help you. By this way, Layla Hair can interact closely with customer. Layla give effective and practical advices to them in order to sell proper hair toppers for each customer. As a result, come to Layla Hair, you don’t worry about anything and can find the best one for yourself. To choose human hair toppers with bangs is not simple, many people still think that it must match with their skin color as well as make up, otherwise it will cause aversion. “The use of wigs seems to have become a trend, the young Popularity”. The deep black wig has long, dark hair. At present, dark brown wig, brown chestnut is most preferred. Because close to popular Hair toppers (toupee hair) color and with many colors. The advantage of flat-legged hair topper is that it is easily covered by an uneven tie between the wig and the forehead. This is also the easiest and most popular Vietnamese Wigs and Hair Toppers. Compared to straight hair, a little human (wig) hair topper that floats, “disorderly” will feel more like real hair. However, do not choose wigs with curls that are firmly pinched and streaky because they are quite rigid and unfocused. If you have bangs on your head, you can see that your head is bigger than normal. Because your hair topper is too thick, consider it before you choose it. The thrust is also a special detail to note. Are you ready to go to laylahair.com for more details and choose the hair topper with bangs for yourself?